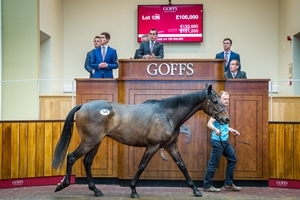 The Goffs UK Spring Sale got off to the best possible start at Doncaster today with the Store Sale seeing a huge buying bench featuring people from every facet of the NH industry driving solid increases in the sale’s figures. Despite accepting 10 fewer horses than in 2015, the sale’s turnover grew 11% to £4,280,500, with the sale average increasing to £23,391, up 20% on last year. The median also showed significant growth, up 33% to £20,000. Today’s sale saw two lots share the top price of £105,000 with Moanmore Stables’ Great Pretender Gelding (Lot 126 - pictured top right) the first to reach the mark when selling to Tom Malone who purchased the horse on behalf of Paul Nicholls. Kirriemuir Stud’s Robin des Champs gelding (Lot 144 - pictured bottom right) matched that price shortly after when selling to Gerry Hogan who was buying on behalf of Emma Lavelle. 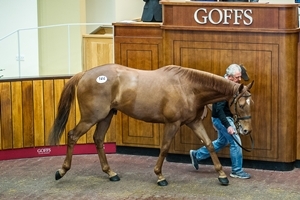 Last year’s top price of £80,000 was also met or surpassed on a further two occasions with Lakefield Farm’s Kapgarde gelding (Lot 238) selling to Aiden Murphy for £85,000 and Cottage Field Stables’ Stowaway gelding (Lot 75) selling to Colin Tizzard for £80,000. “We have enjoyed a vibrant trade for our Store catalogue today and seen growth in every sector. The average advanced by 20%, there was a 33% jump in the median, and a top price some way ahead of last year, all of which flowed from an impressive 82% clearance rate. “As ever we are indebted to our vendors from Britain, Ireland and France who have supported us with a strong selection of NH youngsters. They have been rewarded by a diverse buying bench with plenty of competition at all levels of the market and a multitude of bidders competing at the top of the market. The Spring HIT Sale will start tomorrow at the later time of 12 noon with tomorrow’s sale focusing on young horses with form and Point-to-Pointers. The second and final day of the Spring HIT Sale will be Thursday which will focus on the end of season HIT dispersals and will start at the normal time of 10 a.m.